Treat yourself when living in Roanoke at Mugs Bakery. Temptations are found in overload in the little brick building located at 102 Oak Street. Here the business of quieting rumbling tummies and satisfying those cursed with a sweet tooth is taken quite seriously. The menu is stacked with mouthwatering options. Turnovers are tasty and stuffed with fruit. Choose from apple cinnamon, cherry and apricot. Scones are simply fabulous. Muffins make mornings seem a bit brighter. Customers can’t get enough of croissants, both fruit filled and chocolate. Those seeking a heartier morning meal often select the ham and cheese croissant. Chocolate lovers living in Roanoke always find themselves on the steps of Mugs Bakery. The chocolate dipped brownies have a reputation far and wide as the best of the best in the DFW real estate region. These delicious concoctions feature a sensational chocolate brownie smothered in chocolate buttercream frosting and dipped in chocolate. Folks who prefer a little less chocolate find plenty of additional pastries to please. Cupcakes, cookies, pies, eclairs, macarons, mini cheesecakes and more all have their place in the bakery case. Mugs Bakery isn’t all about the treats. Sandwiches set the scene for light and lovely lunches. Residents from Roanoke homes often stop in to meet friends and catch up on the latest news. Chicken salad sandwiches and turkey melts are popular with the locals. And, when there’s a party scheduled on the calendar this small eatery comes through. Savor the day and leave the menu up to them. 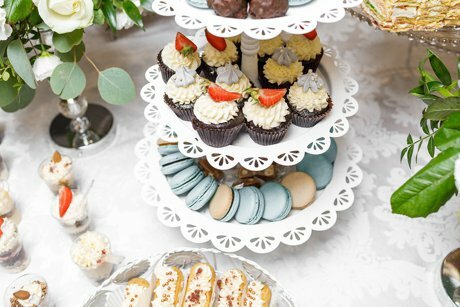 Catering options include sandwich trays, finger sandwich trays, dessert trays, morning pastry trays and sack lunch options. Birthday and all occasion cakes are ready to go in a variety of styles, flavors and colors. Themed cakes can be pre-ordered. Engaged couples in the area discover one of kind custom wedding cakes perfect for adding the final touch to their perfect day. Catering inquiries can be made by calling 817.430.3474.